There is no one on the Earth without talent but need is just to display it. This opportunity to showcase their talent, was given to the students by APS Mathura under its one-day ‘Talent Hunt Fest’. To ignite the critical thinking of students, the school organized Inter- School Debate Competition on 27th November, 2017 at Tarapore Hall. The programme commenced with lighting of the lamp followed by lively and democratic debate on the topic ‘No Detention Policy of CBSE till class VIII be Abolished.’ There were total 6 teams embellished with the names of world-famous poets like Keats, Shelley, Wordsworth, Coleridge, Milton and Byron. All the participants strongly put their opinions and replied to their Interjectors. After that the result was declared where APS Mathura Cantt. made a clean sweep by securing the Trophy of The Best Speaker (For and Against the Motion) and The Best Interjector. The overall Trophy went to APS Mathura Cantt. On the other hand, St. Dominic’s Senior Secondary School and Kanha Makhan Public School secured Second and Third positions respectively. The judging panel was graced by Dr. Zaheer Hasan, Dr. G. B. Pandey and Mrs. Jaishree Sharma. Lastly, the principal thanked all for their support and contribution. After completing Class X, it is always a tough call for students to choose their stream. Most of the times, students ignore their interests and go by the previous trends. This may result in unintended consequences in the long term career prospects. Keeping this view, an aptitude test for the students of classes IX-XII was conducted by FUEL (FRIENDS UNION FOR ENGINEERING LIVES) from 24th to 28th April, 2017 directing them the opportunities that suit their interest, potential and aptitude. Now, it (FUEL) had conducted a career counselling session for the students of classes IX-XII from 20th Nov to 24th Nov, 2017 to dispel the doubts and qualms students had regarding their career. Total 624 students have attended the session along with their parents. Mr. Manish, the Regional Head, FUEL briefed the students about different career opportunities and guided them to grab the right opportunity.It was followed by an individual counselling of the students with an aim to provide necessary or timely information or guidance to envision and realize their future. The session was highly informative and fruitful for the students. Mask making competition for class I & II and pencil sketch competition for class III was organized on 6th Oct 2017 to explore and encourage creativity in children. An inter house fancy dress competition was organized on 19th Aug 2017 for classes I, II & III. It was the most awaited event as it is always a great pleasure to watch children dressed up as different characters displaying their vibrant costumes. An Inter House English story telling competition was organized on 4th Aug 2017 for classes I, II & III with the aim of enhance the speaking skills and to encourage. All the students to be more involved in language while they are in the Class. The Annual Sports Day of APS Mathura was organized on 14th Nov,2017 amidst great mirth, verve and camaraderie. 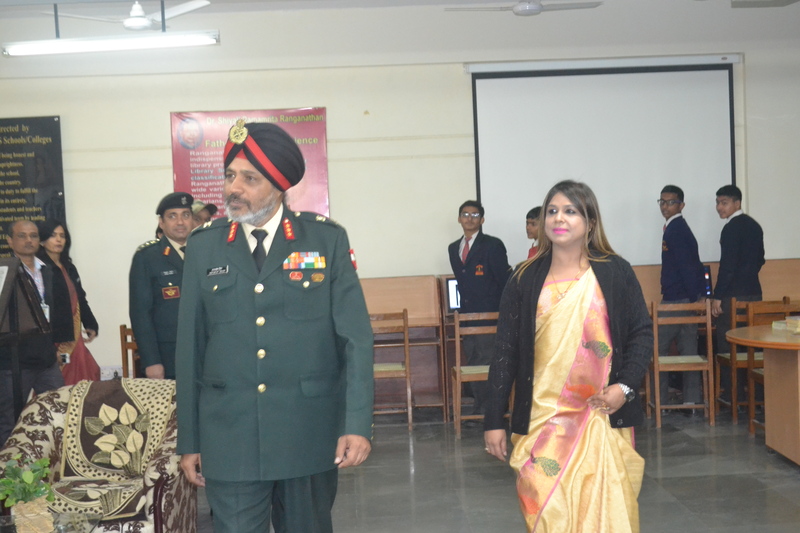 The program began with the welcome ceremony of the chief guest, Maj Gen V.D. Dogra, Patron APS Mathura and other dignitaries. The event was inaugurated by releasing the dove by the Chief Guest and the balloons were also released by the tiny tots of our school. This was followed by the lighting of torch and the well synchronized March Past by all the four houses which rendered the spectators speechless and awestruck. Further the oath ceremony was conducted to uphold the spirit of true sportsmanship by the Head Boy. Then the much awaited field and track events started following the SLOW CYCLE race for the parents and teachers. The students cheered for their teams with high spirits and the spirit of the Cheer Girls also added charm to the event. Lastly the winners of the events were awarded by the Chief Guest. The overall SPORTS TROPHY was bagged by SAROJINI NAIDU HOUSE. The Chief Guest congratulated the Principal and the entire team for the success of the event. The program ended with the vote of thanks by the Principal followed by the National Anthem. Three students of APS Mathura have brought laurels by winning GOLD, SILVER and BRONZE medals at a recent 15th WKI INTERNATIONAL KARATE CHAMPIONSHIP held from 2th to 7th Nov 2017 at SUGATHADASA INDOOR STADIUM COLOMBO SRILANKA. The aim of this championship was to bring the best talent in KARATE into light and to expose this art at international level. SIMRAN of class X won the GOLD MEDAL, ABHISHEK of class VIII secured the SILVER and the Ex- student AMARDEEP SINGH won the BRONZE MEDAL. The meticulous training given by Ms. GUNJAN DIXIT, the SPORTS TEACHER & COACH (BLACK BELT 4DAN ) motivated the students to win. To create love for environment among children, to make them aware of uses of waste material and to give them a lesson on reducing waste to save the future, the BEST OUT OF WASTE COMPETITION was conducted for the students of class IV and V on 30th October 2017. In this competition 12 students participated, three from each house. The children thoroughly enjoyed using their creativity to innovate and create new things. Fantabulous ideas were demonstrated by the students and their work was judged by Mrs. Neerja Khaneja, the SUPW teacher and Mr. S K Verma, the Drawing teacher and the best creativity was awarded.